DuraCel RM is a heavy duty, high efficiency filter designed for use with centrifugal compressors and gas turbines where severe surging and pulsation occur. DuraCel RM has metal cell sides with spot welded face guards and a flange header on the air entering and air leaving sides. The pack is folded between aluminium separators in a pleated design. The edges of the separators are longer than the inside folds of the . This construction prevents the separators from moving and puncturing the . 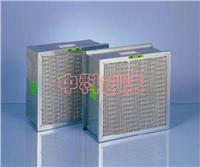 The filter is a finely woven glass mat which is capable of operating temperatures up to 150°C . Two versions are available:RM-60 and RM-90.The filtering efficiency of the RM-90 is in excess of 99% by the weight test method.The filtering efficiency of the RM-60 is 98% by the weight test method. DuraCel RM filters are replaceable with other AAF filters and with competitive brands without any alteration to the filter frame. When installing DuraCel RM filters, be sure to insert them in the proper direction to the airflow as indicated by the eyes and hands located on the cell side. Place the filter in the frame, secure the filter against the frame gasket by rotating the spring lock into position, and tighten the thumb screws. Where the DuraCel RM frame is flush against a plenum wall and wing nuts cannot be used, hex nuts are provided for securing the spring lock. Spring locks are staggered to prevent interference with the adjacent filter frames.DuraCel RM filters are fully disposable when their final resistance has been reached. There are no wire baskets or other retaining devices required to change the filters. requirements. This will affect the filter life and, therefore, the intervals between replacements. Special sizes are also available in 24 x 12 x 12 inch (1700 m3/h) and 24 x 12 x 6 inch (850 m3/h).